It’s not every day you see a documentary about a person who’s murdered while the film is being made of them. In 1969 Mike Gray was filming the nascent Illinois Black Panther Party, when two of its members, Fred Hampton (or as he was then known “Chairman Fred”) and Mark Clark, were shot and killed during a predawn police raid on Panther headquarters. Gray and his crew arrived not long after the raid and filmed the scene. That footage forms the core of The Murder of Fred Hampton. This film is essentially a continuation (and conclusion) to another Gray/Alk documentary from the same time and place, American Revolution 2. 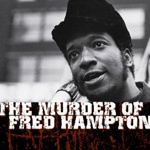 The Murder of Fred Hampton is like American Revolution 2 in that in the course of the film the Chicago police cross a line, and we observe the results. As in American Revolution 2, the camera catches the Chicago PD with their pants down. Shortly after the killing, the office of State’s Attorney issued a statement saying that Hampton had been killed in a shootout with police. But Gray’s film record showed that all the bullet holes were made only by rounds fired into the apartment, not out of it. It was as if the cops were coming from an earlier era when you didn’t need to worry about niceties like just cause. Or maybe they were simply acting in the tradition of the no-nonsense Chicago police response to the Republic Steel Strike of 1937 where the police fired on strikers as they dispersed, or the previous year’s police riot in Grant Park during the ‘68 Democratic Convention. Hampton is also like Revolution in that Mike Gray brought Howard Alk in to edit the footage. Alk’s style is to simply present the film without embellishment, though Hampton does have more structure than Revolution. Hampton is perhaps closer to a traditional documentary, in that it has a definite purpose in mind (the illumination of the events surrounding Fred Hampton’s death). But Alk did not dwell on the particulars and the viewer must rely on their own knowledge of the event and characters involved to get the full effect. Forty years later, it’s unlikely that most people seeing this film will know what’s going on. In this respect Hampton is also like Revolution and the notes included in this DVD are very useful. The attack on Panther headquarters was the first in a line of similar post-World-War-II events that would lead to such diverse shootouts as the LAPD vs. the Symbionese Liberation Front in Los Angles, the AFT vs. David Koresh and company in Waco, and the FBI vs. Randy Weaver and company at Ruby Ridge. Wether you are coming from the left or right, the end result seems to be the same, your cause gets a martyr to rally around. But unlike L.A., or Waco or Ruby Ridge, the death of Hampton seems to have been an intentional hit without the pretense of having first cornered the quarry before proceeding with an assault. The passion surrounding the death of Fred Hampton has faded with time, though as the notes point out, the fire as not died out completely. In 1983 there was a $1.85 million settlement between the City of Chicago, Cook County and the survivors of the raid and the relatives of the two slain men. In 2006 there was a movement to rename a street in Chicago after Hampton but opposition led by the Fraternal Order of Police successfully tabled the idea indefinitely. Like American Revolution 2, the picture and sound are rough and grainy but the DVD seems to have been made from a very clean print. Be sure to read the accompanying notes. Mentioned there (but not in the film) is the story about one of the Panthers who was an FBI mole. Apparently Hampton had been drugged before the raid, which is probably why he was still in bed when he was shot at close range. These are details that came out in trials during the 70’s after the film was made.